Pelenna Patchworks: Welsh quilting and Welsh quilts - a brief history! Welsh quilting and Welsh quilts - a brief history! People often ask me how I got interested in quilting, and one of the earliest things that inspired me was a book on Welsh quilting. 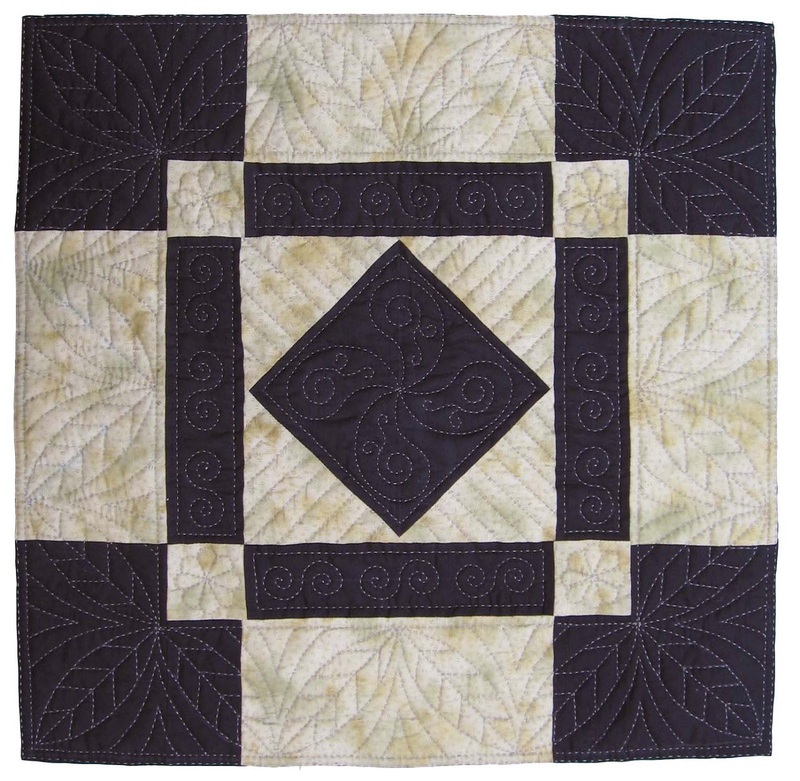 I thought that the simple style and intricate quilting of the old Welsh quilts was beautiful, and a hobby was born! I've visited lots of places that show Welsh quilts and researched some of the history, so this is a potted guide just to share a bit of the information I've gathered. 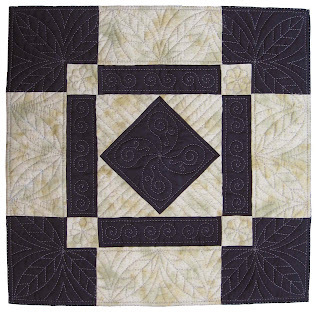 Quilting has definitely been part of the Welsh culture since the late 18th century - although it is likely to be an older art in the country, there is very little evidence surviving of Welsh quilts before this time. It is a little after this that there became a recognisable Welsh style of quilt-making, in their wholecloth quilts and woollen quilts in particular. Initially, due to the cost of fabrics for quilting, quilts were roughly made from home-spun woollen blankets. In the middle of the 19th century less expensive printed fabrics began to become available to the masses and quilting production really took off - many of the best examples being made from Welsh flannel. It is the Welsh flannel quilts in their bold colours and geometric shapes that give rise to the comparison between Welsh quilting and the more well known Amish style of quilting, and as there was a great deal of Welsh immigrants to America at this time, particularly to Pennsylvania, it seems impossible to deny a link between the two. The design influence also passed back to Wales, with American block designs appearing in Welsh quilts from this time as Welsh families travelled to and from America. The wallhanging below is one I made, inspired by Welsh patchwork techniques, hand quilted with traditional motifs such as spirals and the Welsh pear, or paisley design. Quiltmaking in Wales however was not a hobby, it was a profession. Making quilts was one of the few ways a woman could earn a respectable living , and as there were many miners' widows around it meant that a woman could support herself and her family. Quilts were made to order by the local seamstress, many housewives in the area would get new fabric and wadding each year and have a new set of bedding made up for the winter - although there was usually a 'special' quilt in the household reserved for important guests. Quilting in Wales remained an important industry until the early 20th century, when mass produced items started to take over. There was a resurgence between the two world wars when the Rural Industries Bureau established a programme to encourage craft industries in areas affected by economic depression. The quilts made during this time were mainly high quality quilts to sell as luxury items in wealthier areas. Sadly though, fabric production ceased during World War II, and after the war there was neither the necessity or the skills remaining to carry on the craft in any major fashion. The Welsh Quilt Centre, Lampeter - Includes quilt exhibitions, courses and gallery shop, well worth a visit! The Museum of Welsh Life, St Fagans - Includes a large historical textile collection, with patchwork quilts on the beds in the re-erected houses plus more available to view by appointment. The Quilt Association - Membership organisation based in the Minerva centre in Llanidloes, with a great annual exhibition of contemporary and antique quilts. Thank you for this post - it has been interesting to read.